Page Eight debuts tonight as part of PBS' Masterpiece series. It will air at 9 p.m. Eastern and Pacific/8 p.m. Central and Mountain in most markets, but you should check local listings. 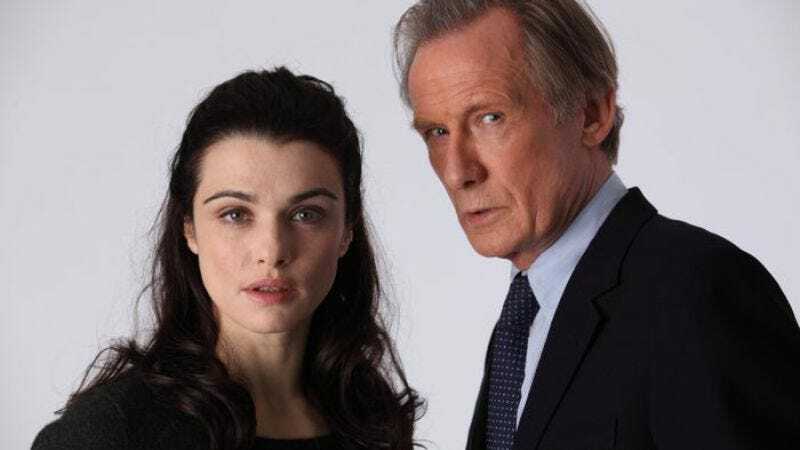 In Page Eight, a new film written and directed by playwright David Hare, Bill Nighy plays Johnny Worricker, an world-weary MI5 agent who is, both professionally and personally, past his prime. A womanizer with a long list of ex-wives, Johnny is estranged from his grown daughter, an artist whose paintings he doesn’t particularly like. At the office, his old-fashioned, apolitical approach to intelligence gathering is falling out of favor in the post 9/11 world. Johnny has a nice apartment and an impressive art collection, but otherwise he is alone. An aging Lothario, he’s half ridiculous, half heroic. Needless to say, it's a part Bill Nighy was born to play. In one department, though, Johnny is exceedingly lucky: he has the good fortune of living across the hall from a beautiful book editor and political activist named Nancy Pierpan (Rachel Weisz). They meet one night on their shared landing, where Nancy makes an unusual request: She has brought a date back to the apartment, but she’s changed her mind and is now desperate to get rid of him. Will Johnny come over for a drink and rescue her? It’s a strange way for someone, especially a young, impossibly attractive woman, to introduce herself to her decades-older male neighbor, but Nancy and Johnny have an immediate rapport. They just click, so much so that you forget the utter strangeness of their meeting. Despite their instant chemistry, Johnny has to be wary: could Nancy actually be interested in him, or does she have ulterior motives? When Johnny discovers that Nancy’s father is a Syrian activist and her brother was killed under mysterious circumstances by Israeli defense forces, his concern grows. The tension mounts when Benedict (Michael Gambon), his best friend and the director general of MI5, distributes a top-secret file which establishes that Prime Minister Alec Beasley (Ralph Fiennes) was aware of illegal American “black sites” across Europe. Even worse, the report indicates that Beasley withheld knowledge of the impending 7/7 terrorist attacks out of a reluctance to disclose how the information was obtained (i.e., through torture). Shortly after distributing the report, Benedict—who also happens to be married to Johnny’s ex-wife—dies of a heart attack, and Johnny has to decide what to do with the inflammatory information. Will he leak it to Rollo (Ewen Bremner, who will always be "Spud" to me), an intelligence agent-turned-journalist? Will he cave to pressure from Beasley to return the file and salvage what’s left of his career? Or will he find some other solution? Technically speaking, Page Eight is a political thriller, but in truth it’s something quite different: a moody, intimate, and often quite funny meditation on the changing role of the intelligence agent in today’s geopolitical climate. Johnny insists that “the purpose of intelligence is to find the truth, not to confirm what we already believe,” but as fellow MI5 officer Jill Tankard warns him, there is no such thing as “pure intelligence” anymore. Most spy movies revolve around mysterious protagonists with oodles of charm but few lasting personal attachments, but Page Eight takes quite a different approach. As fictional spies go, Johnny is an open book. He barely even tries to keep his job a secret from Nancy, and even tries to win her over by uncovering the truth about her brother’s death. As Johnny grapples with what to do about the report, he visits all the important people in his life: his daughter, his ex-wife, his former and current lovers. A complete portrait emerges of a man with a messy personal life but unshakable professional ethics. There’s a This is Your Life feel to this wanderings, which only adds to the sense Johnny is a dying breed. Unlike other writers who gravitate toward political subjects (not naming any names), Hare is intelligent without being showy or heavy-handed. Rather than walking and talking while delivering lengthy monologues about, say, Britain’s special relationship with the United States, Hare’s characters are concise, biting, and still. The script is wordy but not ponderous, and Hare has enlisted a top-notch cast of British talent who know how to deliver their lines with just the right amount of zing; they never sound like they're speechifying, even when they are. For a film about torture and terrorism, Page Eight is also surprisingly funny, albeit in a morose, distinctly English sort of way. Johnny mentions that his second wife was an art collector, and Nancy asks how many wives he has had. “Fewer than five,” he replies. For the most part, Hare’s low-key approach to espionage feels right, but the ending to Page Eight is a bit of a letdown. Spy movies don’t need elaborate car chases or lavish sequences in Monte Carlo casinos, but given the narrative stakes Hare establishes in the first 90 minutes of Page Eight (i.e. a Prime Minister who knowingly allowed his citizens to die in order to cover up his complicity with illegal American activities), the resolution feels inadequate and anti-climactic. Page Eight leaves you wanting more. Mostly, it’s for the right reasons.